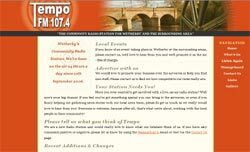 Chief2moro designed and coded a complete web solution for Tempo FM, a community radio station broadcasting out of Wetherby, West Yorkshire. The package Chief2moro provided to Tempo FM, allowed them to take complete control of their site's content using our SiteChief content management system (which also powers this site). 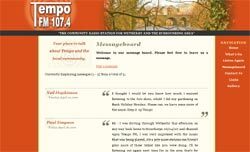 They can now add new pages, images and navigation links via a simple login (through their web browser) to the admin section of the Tempo FM site. The site is designed with a bold and vibrant colour scheme with a modern clean looking design, creating a direct synergy with Tempo's broadcasting outlook. Other features include a messageboard facility, allowing Tempo's listeners to post (moderated) feedback directly to the Tempo site.